Guatemala, officially the Republic of Guatemala, is situated in Central America, in the extreme northwest of the region, with a broad indigenous culture stemming from its Mayan heritage and Spanish influence during colonial times. Despite its relatively small area, Guatemala has a greatly varied climate, as a result of its mountain relief that runs from the sea level to 4,220 metres in height. This means that ecosystems in the country range from wetland swamps to cloudy mountainside forests. Framed to the west and north by Mexico, to the east by Belize, the Gulf of Honduras (Caribbean Sea) and Honduras, to the southeast by El Salvador, and to the south by the Pacific Ocean. The country covers an area of 108,889 km². Its capital is Guatemala City, officially called «Nueva Guatemala de la Asunción». The official language is Spanish, although there are 23 other Mayan languages. Destination may be affected by the Zika virus. Check www.gov.uk for full details. 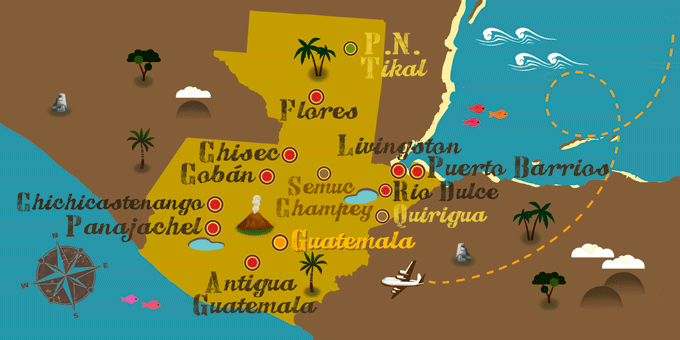 If Guatemala has caught your attention, leave us your number so we can call you to discuss the voyage that awaits you.